Greetings and a hearty MDK welcome to one of the online knitting community’s brightest stars, Dana Williams-Johnson. While Dana is responsible for a prodigious number of people-sized sweaters for herself and others, she shares the spotlight with two tiny housemates, Cher and Jellybean. 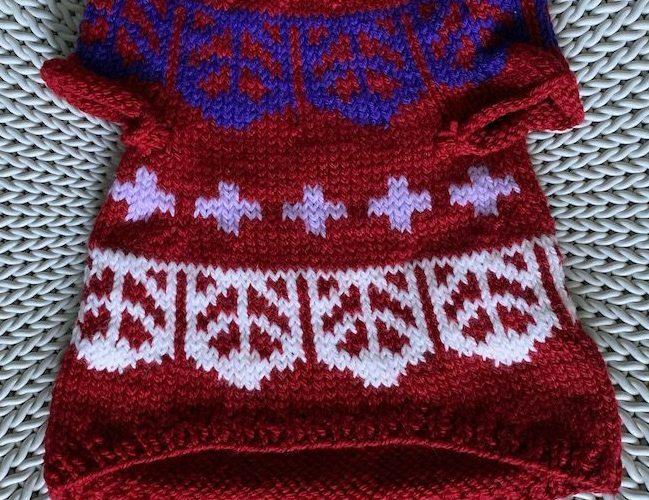 Dana’s freehand conversion of colorwork sweater patterns into versions for small dogs looks effortless, and we (ahem, especially Kay) were curious about how she does it. Thank you, Dana, for sharing your process here. I knit a lot and specifically I love to knit sweaters. But let’s be honest, what attracts the most attention are my dogs in sweaters I’ve knit them. As my sweater skills improve, I’ve found that modifying patterns to fit my dogs is probably the most fun thing to knit. It started with my Angelina sweater. 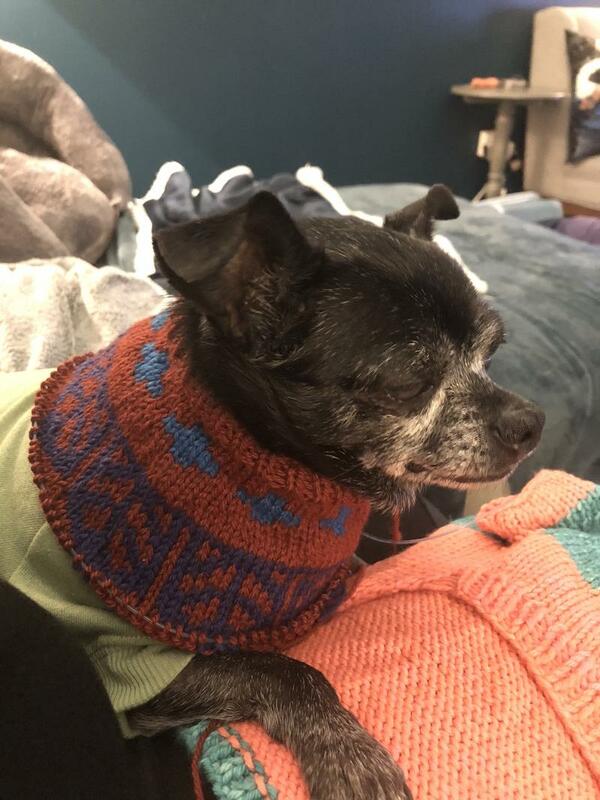 I knit one for myself, and the entire time I was knitting it, my smallest dog, Jellybean, was using the ball of yarn as her pillow. When I finished knitting my Angelina I thought, I’ve got yarn left over, how do I adapt this sweater to make Jellybean one too? She’s so small that most standard dog patterns weren’t made to fit her. But that spark of curiosity is what led me down the custom dog sweater rabbit hole. In my opinion, the best sweater style for dogs is a circular yoke sweater. Why a circular yoke? Dogs don’t have shoulders like we do, and the sloping style of a circular yoke seems to be one of the best ways to adapt a human sweater into a dog sweater. If you’re thinking of knitting your dog a sweater, here are a few things you need to know before you get started. Gauge: I find this to be the easiest part when adapting a pattern. I’ve already got my finished object (my own sweater), so I’ve got gauge and know what needles I’m going to work with. Dog’s measurements: You need to know your dog’s neck size, chest width, length from neck to tail and the distance in the front to where you want to end your sweater. (Some people with male dogs like to end their sweaters a bit shorter than you would with female dogs.) 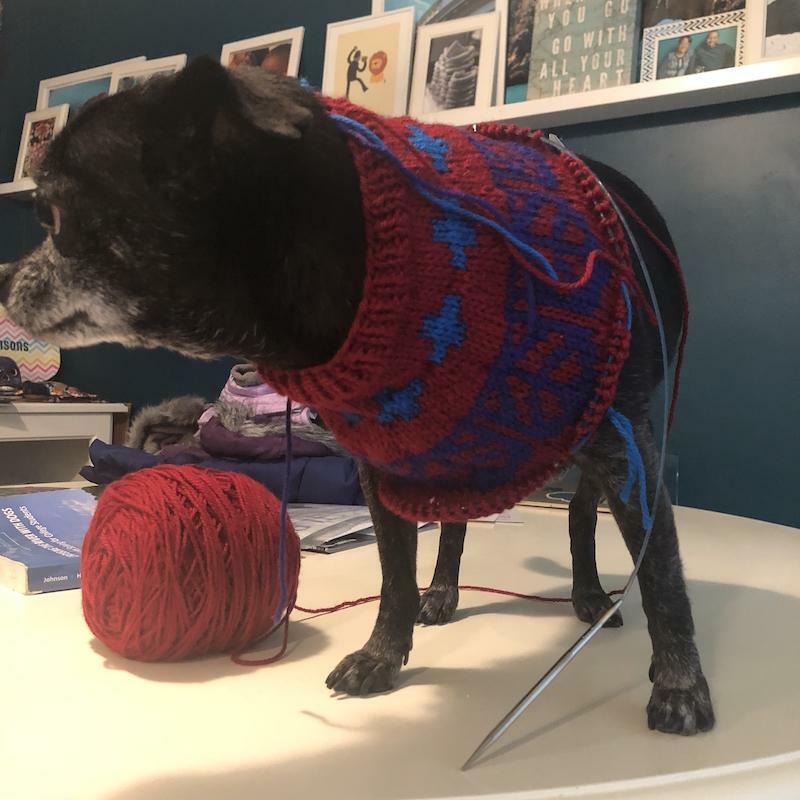 I also measure the distance from the neck to where the armholes would start on the dog’s sweater; it will help you know how much room you’ve got to work with if you’re incorporating colorwork or cables. 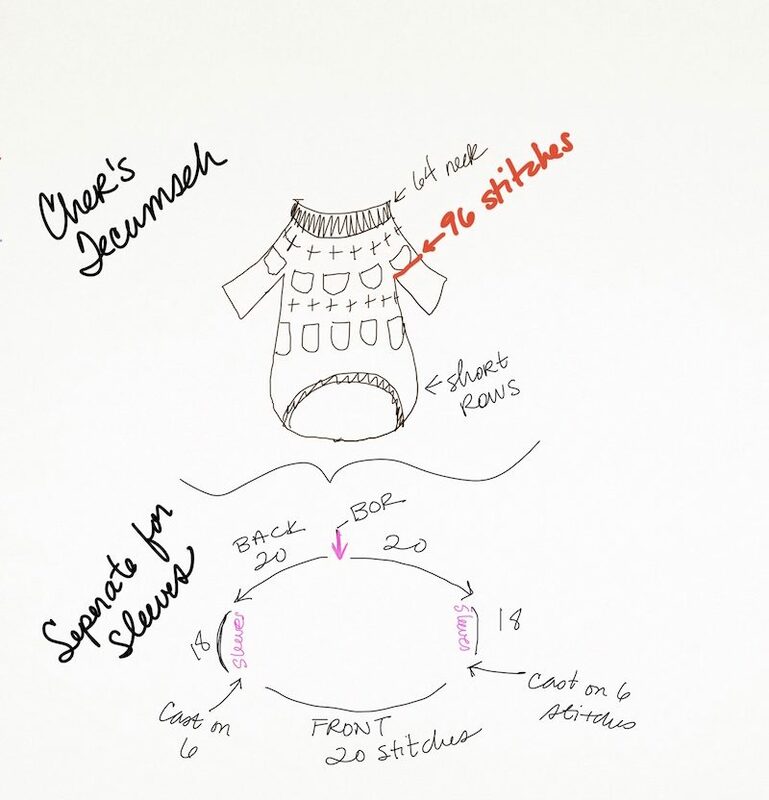 Patience: I prefer a top-down sweater style so that I can try it on my dog as I go along, but you’ve got to have patience and sometimes treats to get them to cooperate as you adapt the sweater to their body. For my Tecumseh sweater I got gauge at 22 inches by 28 inches over 4 inches of stockinette stitch on size 6 needles. 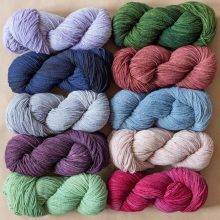 I was going to use the exact same yarn for the girls’ sweaters as I did for my own. Cher has just under a 12-inch neck, so if I multiply 22 x 3, I’ll get 66 stitches, or about 12 inches. I decided to cast on 64 inches of ribbing for her the neck to help myself with the math I’d have to do to accommodate the colorwork pattern. For the yoke, I knew I had about 4 inches before I was going to separate for the sleeves at her chest. Cher’s chest measures about 18 inches, so before I got to the sleeves, I needed to increase from 64 neck stitches to 96 stitches to keep a multiple that would work with the colorwork. I decided to gradually place four 8-stitch increase rounds through the colorwork yoke to add the necessary 32 stitches. For Cher’s sweater, I kept the colorwork and charts identical to the original people sweater. For Jellybean’s smaller sweater, I modified it a bit, making the crosses smaller and omitting a few pieces of the feather to make it fit. The trickiest part is armhole placement. The back of a dog sweater is typically a bit wider than the chest. Before I put sleeves on waste yarn, once I’ve gotten to the chest width I mark the armholes with removable stitch markers, and then slip the piece over my dog’s head to make sure I like where I’ve placed them. For Cher’s sweater, I made the back 40 stitches wide (20 stitches on each side of the beginning of round marker). For the sleeves I put 18 stitches on each side on a piece of waste yarn (I prefer a wider sleeve than a super slim one, just for ease of putting a sweater on a dog). I then cast on 6 stitches at each underarm to give her room, and left 20 stitches between the two sleeve holes for the front. The best part of knitting a top-down sweater is that there are multiple opportunities to try it on as you go, as long as your dog is willing to deal with the fittings. After you’ve determined sleeve placement, it’s smooth sailing with body work. Often, I’ll mimic the shape of the original sweater, or continue the colorwork a bit for the body. Lately I’ve been opting for a curved hem with short rows to accommodate the front and still give coverage for the back. Once I get the front to the length I want (minus any ribbing), I place stitch markers at the front 20 stitches and then work back and forth with short rows to shape the back of the sweaters. It gives a soft curve to the sweater and a little bit of extra style. Cher shows off the curved back hem. 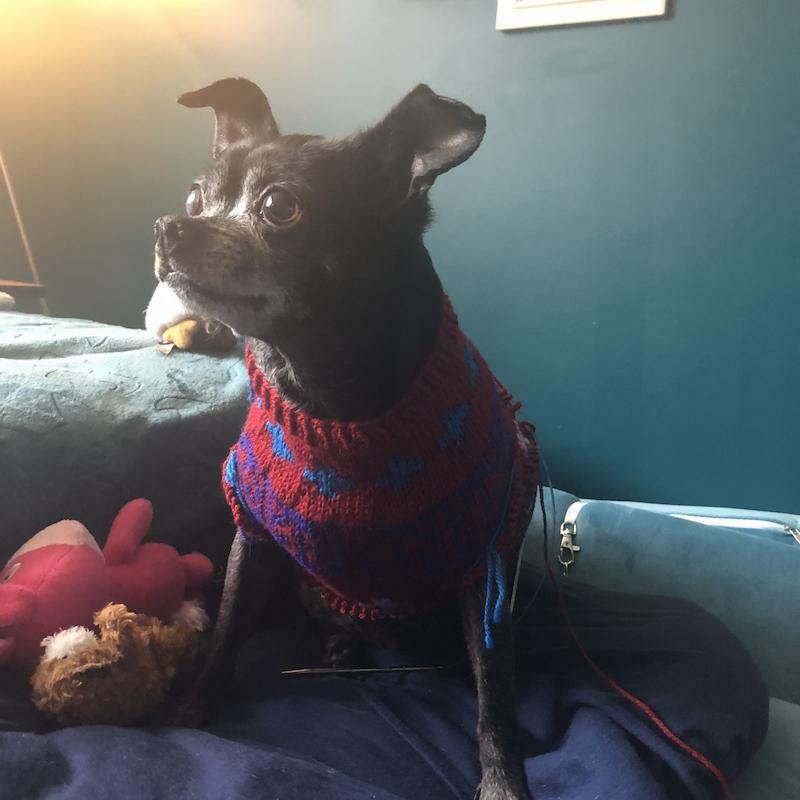 Jellybean definitely has more sweaters than Cher, since she’s smaller and always cold, but these are so quick and easy to make for a small dog that I can’t resist making them. It’s a fun thing to make that always makes people smile. If you feel there are not enough pictures of Jellybean and Cher and their sweaters in this post, we recommend this one. Wouldn’t it be nice to be able to find this article again when you’re ready to freestyle a dog sweater? Here’s how to save this article in your MDK account with one click. 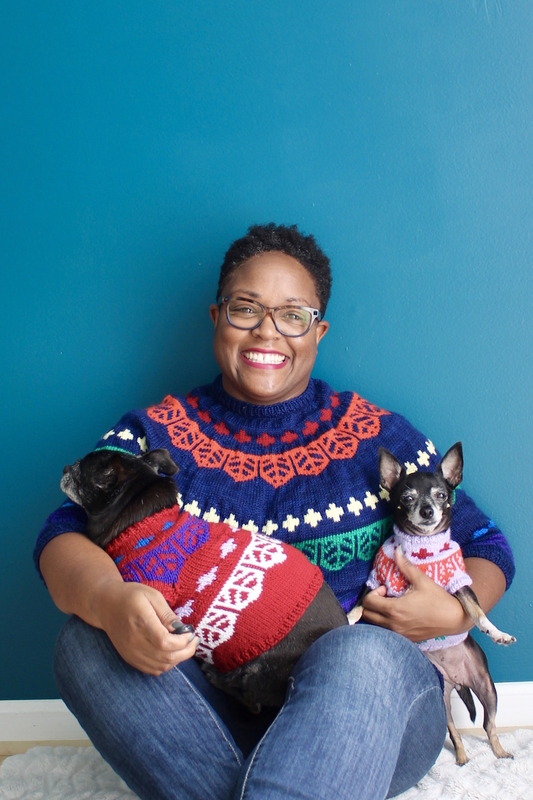 Dana Williams-Johnson knits every day. Her claim to knitting fame is knitting 27 sweaters in a single year. 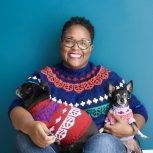 When not squeezing skeins of yarn or knitting, Dana is working as a professor in Marketing at Howard University in Washington, DC, or spoiling her two rescue dogs, Cher and Jellybean. Oh, and she spends time with her husband, too. 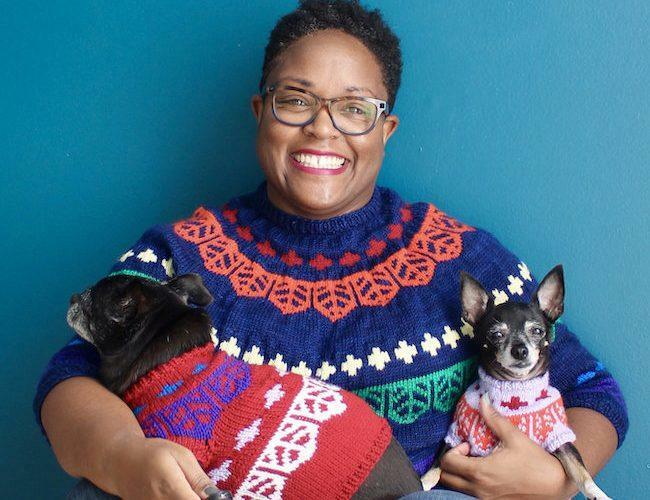 Knitting is what brings Dana joy, and she shows that through her use of color (hello, rainbows) and modifications of favorite patterns into replica sweaters for her dogs. 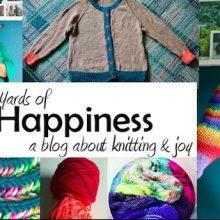 You can read about it all on Dana’s blog, Yards of Happiness. 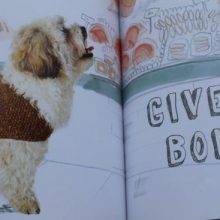 Excellent article about knitting sweaters for dogs. I have two wire-haired daushunds that I would love to knit sweaters for them to wear outdoors although I know that they would be kicking and barking. How do I save this article for reference? Copy and past the web address in your search bar and email it to yourself, or save it to Pinterest. In the short time I have subscribed to your newsletter, I have come to eagerly look forward to see what interesting snippet will be in my inbox each morning. Thank you for the broad range of posts. I love everything about this. I see dog sweaters in my dogs’ futures. Hi Dana! So nice to see you here on MDK! 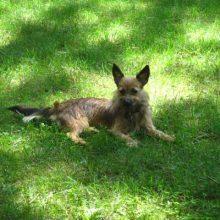 I’ve admired your tiny dog sweaters (AND your tiny dogs) from afar on your blog and on Ravelry. Now that was a fun way to start the day. I am always in awe of DWJ’s blog and her incredible and beautiful productivity. My DIL always asks for dog sweaters- for two Airedales! I continue to disappoint her by not knitting them sweaters. Dana is an absolutely AMAZING and an INSPIRATION!!! I wish she lived in New York- I’d hang out and knit and learn from her!! I read this early this morning and it was a great start to the day. Those pictures of Joy, Cher and Jellybean in their colorful sweaters made me smile. Thank you for sharing how you do it. Awesome post!! Thanks for the super info. Love to see your sweaters. They are gorgeous. You inspire me to make more! What happy knitting! Lucky dogs! Thanks for sharing your process Dana! 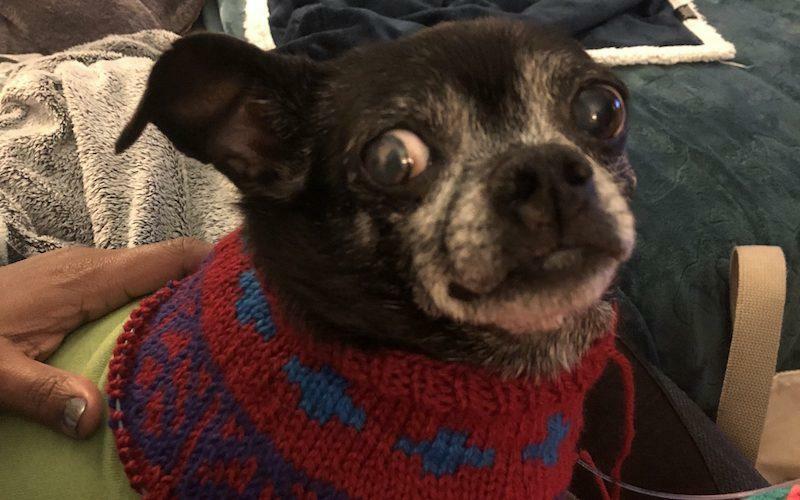 I haven’t made any dog knits yet… but I did smile at the suggestion to give treats while trying on an in-progress sweater – I use the same tactic with my daughter! What a terrific article and reference! Dana, you brought awesomeness to my morning by combining my favorite interests: knitting, dogs and canine couture. Thank you for sharing your thought processes with such clarity. Cher and Jellybean are adorable! This is cuteness overload AND educational/inspiring! Thanks so much for sharing the wisdom and pup shots! My Yorkie puppy is SO hating on you right now—she is nine months old and doesn’t like clothes, but Mama sees some fair isle in her future! I love it when my cyber world collides. What a surprise to see my other favorite blogger show up in the MDK daily post!!! Dana, you are amazing and you motivate me with every one of your posts! I was delighted to see this post this morning as I have wondered how to adapt a person sweater to fit a dog. I’ve had yarn left from my stopover for years waiting for this moment. My entire family loves to see Jellybean and Cher in your IG feed and my pup is jealous of their fashionista style. Thank you for sharing your tips! I love Dana’s blog – so much happiness there! and the matching human and dog sweaters are almost too cute to bear! I so appreciate her passing along her instructions on how she modifies for her dogs. I have a large dog (around 70 pounds and long legs – I think that I will not be able to pull a sweater over her head and then pull her legs through, so I may need to make it open on her underbelly – so I guess I’d need to make a dog cardigan?? I’d love to, but that kind of mod may still be above my skill set right now. 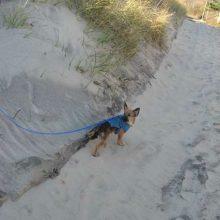 Maybe next winter Maxie and I will go out for dog walks proudly wearing matching sweaters – I would love it! Sounds like a great opportunity for a First Steek! I was just thinking the exact same thing! But put the steek/button band on her back so it’s easier for you to button, and also show off that awesome cardigan, as well as maybe being cleaner. Dana your amazing! Articles like this inspire me. What a treat! Yay! 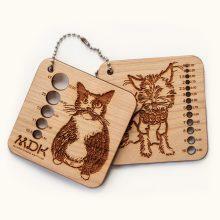 What a great way to start my morning … a little MDK and a little YOH and a whole lot of Jellybean and Cher! This makes me so happy. And also so excited to see a recipe for her dog sweaters. Having followed her blog I’ve been wanting to make matching sweaters for my dogs as well and have always been a bit intimidated. But having read this post I’m all in! Hooray!! This is so cool. I hope Dana comes back to write more articles! What wonderful skills Dana Williams-Johnson has and she gives such excellent directions. But I confess it is her lovely smile that draws me to her most. Thank you for your column, Dana! 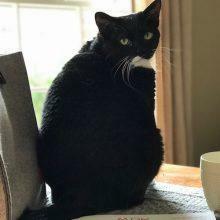 Love your blog, your beautiful knitting and your four legged loves. 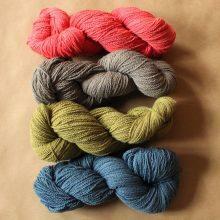 I am about to “embark” on knitting a sweater for my daughter’s dachshund, so wish me luck!! This is perfect timing! I’ve got a sick dog who has blown her coat and a cold front is roaring toward us – high temp tomorrow will be 24 degrees and by Sunday it will only go up to 14 degrees. So by Sunday at the latest I hope to have a sweater for her or else she’ll freeze to death when she steps outside to do her business. Thanks so much, Dana! Simply put, you are some kind of genius and a great doggie-mom too! OMG!!! I’ve become such a fan of Dana’s & her fur babies since I “found” her on IG last week! The flu left me unable to read, knit or do anything except look at pretty pictures through fever lidded eyes. I’d wondered if it was possible that I could learn to adapt sweaters for my 6 lbs. of precociousness, Isabelle. Thank you for this !! A year and a half after our lovely Yellow Lab died, I am looking for a cockapoo. Have saved this article so I can cover the little beast in style next winter. Good to see you here, Dana. I enjoy your blog whenever you post! I’m impressed! Just the math alone would be enough for me to run to PetCo and buy a sweater if our boy would wear one, which he wouldn’t! He runs when we grab his coat, he hates it! However, what I love the most is your smile! I have no dogs and my cats would refuse to wear sweaters, but I am loving the human versions! When your clothes make you smile, whether you are a dog or a human, it’s a wonderful thing! I think you meant 22 stitches by 28 stitches over 4 inches of stockinette. Great article! Can’t wait to give it a go! So delighted to see one of my favorite knitting bloggers, Dana Williams-Johnson, sharing her skills and enthusiasm on MDK. I’m a huge fan of both. What a great coming together! Dana! I lurk on your blog! 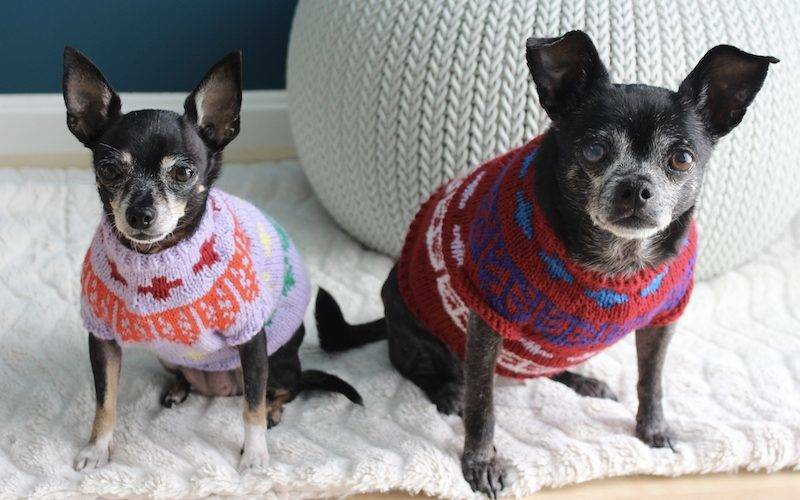 Jellybean and Cher are adorable in their sweaters. 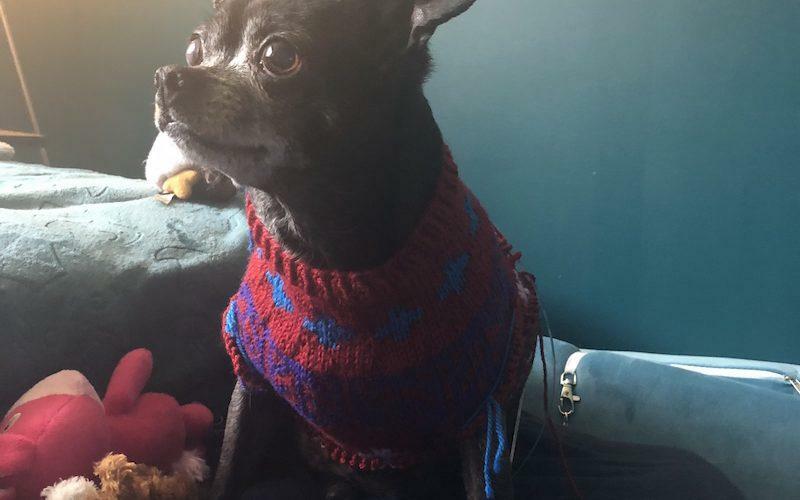 I knit a sweater for my niece’s Chihuahua, Thor, a few years ago. His neck-shoulder ration was problematic, but I think the real reason that it didn’t turn out so well was because I used acrylic yarn. Just like how you should never cook with wine you wouldn’t drink, I’m thinking you shouldn’t knit a dog sweater out of a yarn you would wear yourself! I just finished a dog sweater for Christmas that needed your savvy. I will start a new one…maybe a carbeth? And I will watch for you around town in knitting haunts! Thanks so much for sharing your formula! I’ll be all smiley for the whole day. I love Cher and Jellybean! 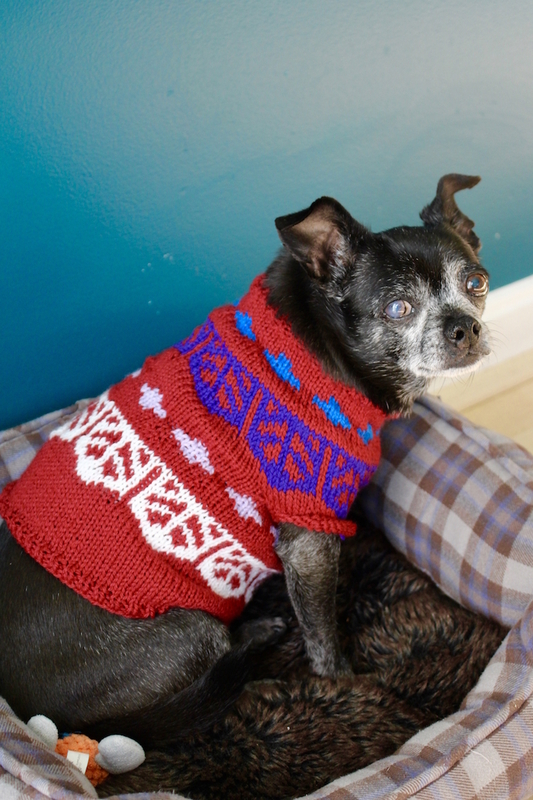 I love how you captured the light in Jellybean’s eyes, as she puts up with modeling the sweater while waiting for her true love, Treat. Also, this: “In my opinion, the best sweater style for dogs is a circular yoke sweater. Why a circular yoke? 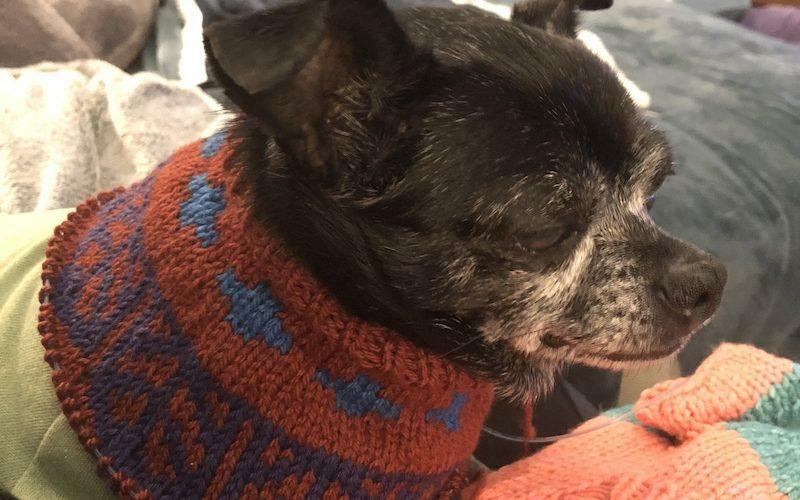 Dogs don’t have shoulders like we do, and the sloping style of a circular yoke seems to be one of the best ways to adapt a human sweater into a dog sweater.” That is the profoundest piece of knitting fit wisdom that I’ve come across in a long time. Thank you! Thank you for this great article! Your dogs look adorable in their sweaters. This is a helpful tutorial. 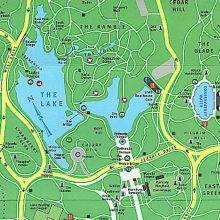 My question is about where to measure — where do you take the essential measurements? My previous misses I think were due to not measuring at the right place, I think. But seeing these definitely makes me want to try again! 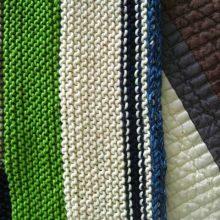 Dana is such an inspirational knitter that I’d love to emulate by knitting daily as well. Her dog sweaters are adorable and so are hers. I look at her blog quite often and was happy to see this article on MDK. Thank you for this recipe! I’m terrible at numbers so I appreciate people who can work out knitting math. I’ve only made one sweater so far and I’m doing my first colourwork project right now. I hope to make good use of your recipe for my schnoodle and my rottweiler. Dana is a knitting rockstar and inspiration. Bless her for the kindness she engenders for our four legged siblings!! This post made me very happy! So nice to see a knitter who is also a crazy dog lady! (Said as a fellow CDL myself!) I’m currently knitting my first grownup sweater and can’t wait to make a matching version for the little Chihuahua in my life. If you ever put together a Craftsy class to help us master the techniques, that is something I would happily pay for! I LOVE these dog sweaters. by some strange coincidence I was looking at dog sweater patterns yesterday and then this morning I see your article! I’m ready to give this a try using your excellent instructions. And you all look so cute in your coordinating sweaters. 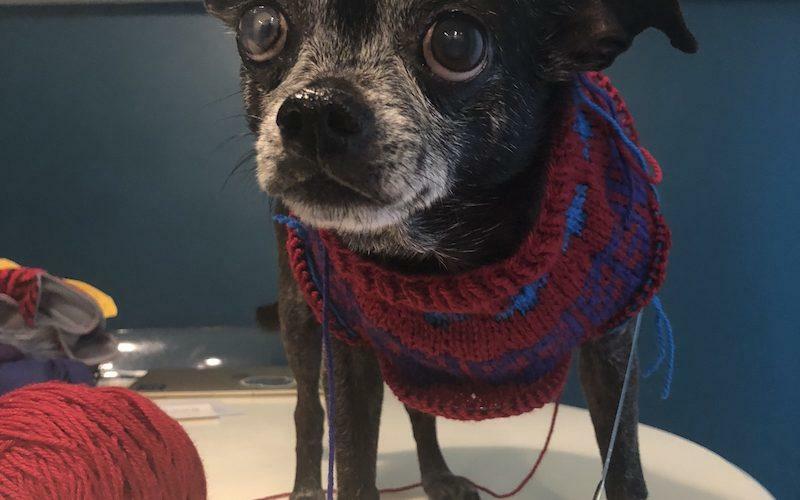 wow would love to see you do a video on making your dog sweater. My favorite sweater is the white and green short sleeved one you modeled on Ravelry! Got to knit it! What a wonderful article, just what I needed. My little guy, Gunner, is an Olde English bulldog and, though short of leg and body, is very broad of chest. I’ve had to modify large/extra large off the rack sweaters for him, but now I feel confident that I can design one myself. Oh, and he LOVES wearing sweaters and will run to get one when it is cold and he needs to go outside. Thanks for your great article! 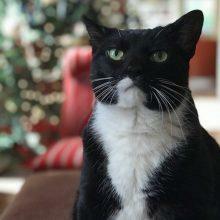 I enjoyed your tale of a dog’s sweater! Your puppies are so cute and so patient! Love those sweaters. 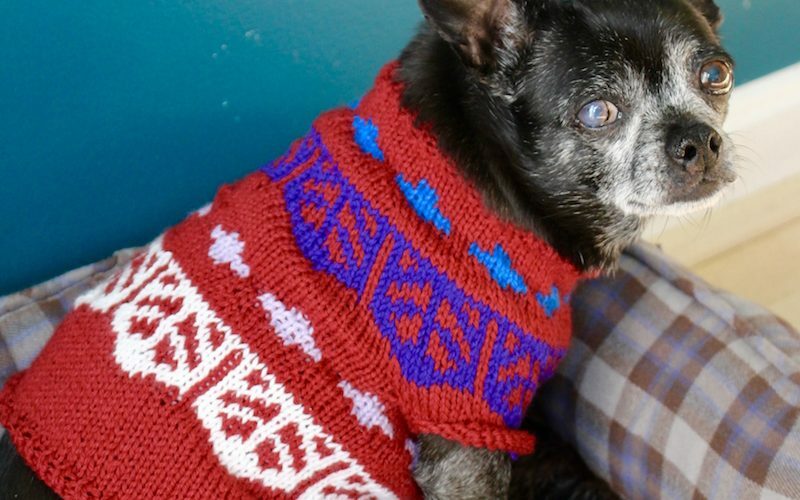 Thanks for the wonderful article about knitting dog sweaters. Thanks for the inspiration! !